Tony being unsure about his desire for kids. Bishop and Jake having relationship issues, as are Tony and Zoe. Below, TV Fanatic panelists Kathleen Wiedel, David Taylor, Christine Orlando and Douglas Wolfe gathered to discuss and debate all of these issues. Are you ready to join in? Kathleen: Where's Dr. Phil when you need him? David: You know our neighbors, The Murderers? Christine: Beauty marks don’t move. Doug: Did you forget ALL your training, Bishop? What are your thoughts on Bishop breaking into the house? Kathleen: Dumb, dumb, dumb. Did I mention dumb? It was like all the experience she's had since she first joined NCIS went right out the window. To make it worse, she left her phone behind, too, so there was no way of contacting her if things (inevitably) went south. To put it simply, stupid contrivance is stupid. David: What Kathleen said. After all the stupid mistakes she made as a newbie, it's tragic that she appears to have learned NOTHING!!!!!! I certainly didn't want her to lose her fight with the Marine and be killed, but she at least "deserved" a concussion or a broken arm or wrist. Something that will afford her time to think about her impulsive behavior while she's confined to desk duty. Doug: I really like Bishop and think she's a good addition to team, if only because she has no snark and is humble enough to be open to learning. But then she pulls a stunt like this, and you know – it's just so tough trying to defend her. I'm with all of you: that was just dumb. Tony tried to get out of going on the road with Gibbs twice. Coincidence or... ? Kathleen: I'm trying not to read too deeply into that, though avoidance seems to me to be a strategy doomed to failure, especially when Gibbs is involved. Honestly, I read that more as Tony not wanting to drive out to Quantico twice in one day. David: I wasn't even thinking along those lines so I would just say "coincidence." Perhaps I'll be proved wrong down the line. Christine: I didn’t pick up on that but with how uncomfortable Tony has been since Gibbs return, there may be something to it. Doug: The second time it happened I figured it was no coincidence. The writers want us to know there's still some unresolved friction between them. I think it boils down to Gibbs wanting Tony to be a leader just like himself, whereas Tony sees himself as a leader in his own right already. It's like there are two cooks in the kitchen. One of them's got to go, and until that happens there will always be some unspoken friction. McGee went into a pout when he found out Tony revealed his troubles with Zoe to Bishop, but not to him. What are your thoughts on that? Kathleen: To be blunt, Tony's business is Tony's business, and whoever he reveals his business to is, well, Tony's business. And when you're dealing with relationship woes, does it make more sense to consult with the person who's never been married or with the person who is married? Bishop really shouldn't have said anything to McGee about Tony's problems at all. 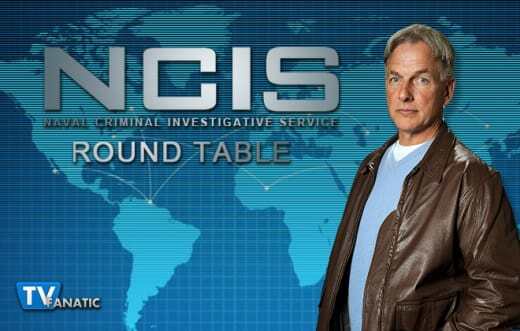 This is NCIS, not a couples' therapy office. David: Well, Bishop and McGee are both in relationships (McGee and Delilah ARE still together, right? ), making either of them a helpful sounding board. However, Bishop is the more "experienced" one since she's married. Even so, this is repeat behavior for McGee-- he went into a similar snit when he found out he wasn't read in on case along with Tony. I think he needs to leave his ego at the elevator door when he comes to work. And I agree with Kathleen here too: this isn't a conversation you have at the office. Christine: Bishop kind of has that little sister vibe and Tony has always found it easy to share with her, plus perhaps Tony wanted a woman’s opinion. Either way, it’s none of McGee’s business and he needs to stop being so darn sensitive. Doug: It's irritating and frankly a little embarrassing watching this guy go off in his pouts. If he ever wants to be taken seriously he's got to start thinking more clearly and stop with the petty nonsense. Most guys I know wouldn't care one way or another if any of us were omitted from each others' confidence regarding relationship issues. It's just not on our radar as "important." Pull your thumb out of your mouth, McGee. It's unseemly. Kathleen: Despite how stupid it was for Bishop to go into the house on her own, I enjoyed the fight sequence between her and the bad guy. There was some serious wincing going on at my house when he impaled himself deeper onto those scissors. Ew. David: No scene, just that moment when we saw the wife's dismembered and preserved body in the packing boxes. To think movers handled that box not knowing what was actually in it – another cringe-worthy moment – along with the bit with the scissors. Christine: I’m with Kathleen on this one. Despite Bishop being beyond stupid, it was an epic fight. She’s lucky those scissors were handy or that Marine would have broken her pretty, little neck. Doug: One thing I didn't note in the review – and perhaps should have – was Bishop's performance at the office with Dean Hudson. She was all smiles and almost flirty with him -- the mark of a great undercover agent. I liked that scene. What could have been done better (or not at all)? Kathleen: Please, please, please do not have Bishop's marriage fail. It was a breath of fresh air to have an actual functioning married couple, and I like Jake. Failed marriages and toxic relationships are a dime a dozen on television, so I hope from the bottom of my heart that they aren't going that way with Ellie and Jake on NCIS. David: Well, I won't nitpick; I'll just talk "big picture." This was a case of "bumping off the wife for her money." Hardly an original plot device. I think we deserved better after 12 seasons. Christine: I’m so tired of all of the failed relationships at NCIS. It’s just depressing and if they insist on going that way I wish they’d steer clear of their personal lives all together. Doug: I'm beyond miffed at Tony-as-office-clown act. I truly thought they had done away with that part of his character and yet here it is back again. They could have left that subplot out and have better used the time elsewhere.